Visitors to the 2011 Countryside Live will be given the opportunity to taste and buy more than 25 different varieties of apples and help choose their favourite. For the first time the rural extravaganza will host the annual Festival of British Fruit. Countryside Live is the little sister of the Great Yorkshire Show and takes place on Saturday 22 and Sunday 23 October at the Great Yorkshire Showground, Harrogate. The Festival celebrates the best of British apples and pears, with at least 25 different apple varieties and up to nine different varieties of pears on display. In addition, visitors are being asked to judge the fruit. A specially selected panel will have the task of voting for Britain’s Tastiest Apple, to decide the overall champion. Alongside the traditional and more well-known varieties of apples on display, the Festival will be introducing visitors to some new apple varieties, including Rubens, produced by a handful of growers in Kent, and Kanzi, a cross between Braeburn and Gala apples. And anyone feeling slightly hungry will be able to enjoy a slice of piping hot Bramley apple pie fresh from the oven! Sarah Calcutt, Chair of the Marden Fruit Society, organisers of the Festival said she was delighted to be bringing the show to Harrogate. “The Festival of British Fruit is now in its ninth year and we take it around the country but Yorkshire is the furthest north we have ever been. “We are looking forward to introducing visitors to the best of British apples and pears, letting them taste and enjoy them, meet the growers and find out where they can buy them,” she said. 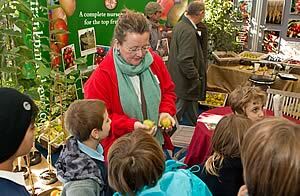 As well as displays of varieties of apples and pears, visitors will be able to see the 2011 largest apple and pear – titles awarded to the fruit at the National Fruit Show which takes place in Kent two days before Countryside Live. In addition, every visitor will be given a free tree, courtesy of the environmental charity, BTCV. Elsewhere around the event, the equine classes always prove a draw and equestrian experts Graham and Tina Fletcher will again be searching for a rising young show jumping star! There are also classes with some of the best cattle and sheep in the country, the Diggerland Experience, have-a-go archery, The Sheep Show, dog agility demonstrations, sheepdog displays with ‘The Mellins’ of TV’s The Dales programme and Ben Potter will again bring his birds of prey. For younger visitors there’s The StoryBarn and The FarmYard experience, introduced for the first time. Organised by the Yorkshire Agricultural Society, 90 per cent of the action takes place indoors, so it’s guaranteed to be a hit whatever the weather. Countryside Live is the sister event of the Great Yorkshire Show, England’s premier agricultural event and last year Countryside Live attracted 10,221 visitors.